Do you keep your schedule and tasks in Google Calendar? Here’s a handy extension for Google Chrome that can keep you on top of your appointments without having to open Google Calendar in another tab. 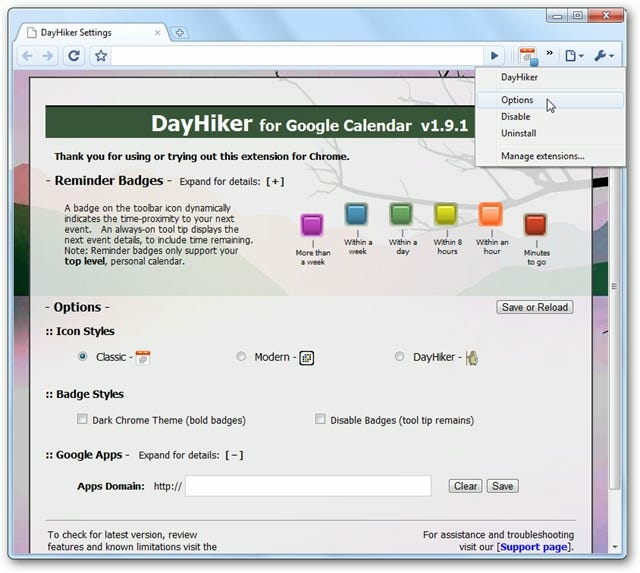 DayHiker is a handy extension for Google Chrome that can help you stay on schedule in your browser. Desktop applications typically can keep you notified easier with popups or alerts, but webapps require you to visit them to view your information. DayHiker takes the best of both, and can make your Google Calendar work more like a desktop application. To get started, open the DayHiker page from the Chrome Extensions Gallery (link below), and click Install. Confirm you wish to install it at the prompt. Now you’ll have a new extension button in your Chrome toolbar. 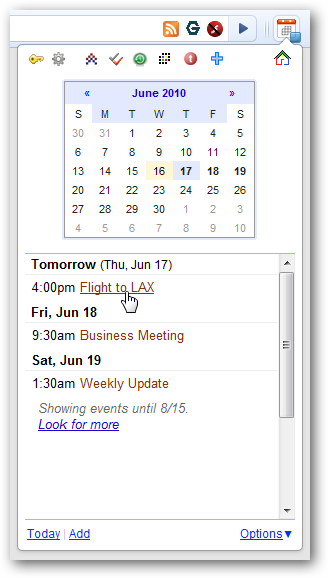 Click the calendar icon to view your Google Calendar. 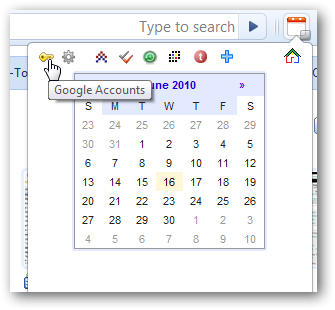 You’ll need to be signed into your Google account for your calendar to display; click the key icon to select your account if it doesn’t show your appointments automatically. 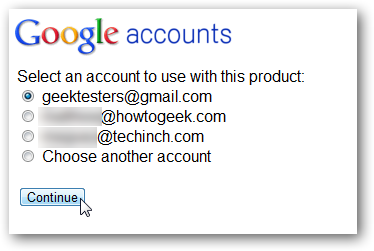 If you’re signed into multiple Google accounts, such as your public Gmail and a Google Apps account, you can select the calendar you wish and click Continue. Now you can quickly see your upcoming appointments. 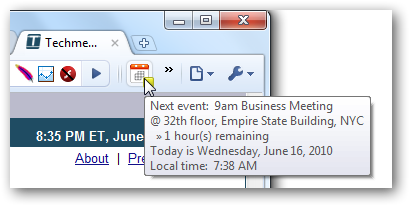 Simply hover over the icon to see your upcoming events. Or, just glance at it to see if there are any appointments coming up, as the indicator icon will change colors to show how long you have until your next appointment. Click the icon to see more information about your appointments. Or, click the Add link to add a new appointment. If you need to edit the appointment details, click Edit Details and the appointment will open in Google Calendar for you to edit. You can also view and manage your tasks in Google Calendar. 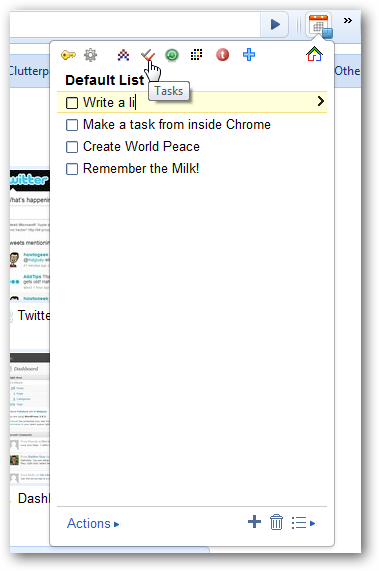 Click the checkmark icon, and then add or check-off tasks directly from the extension pane. You can also set an alarm clock in DayHiker. 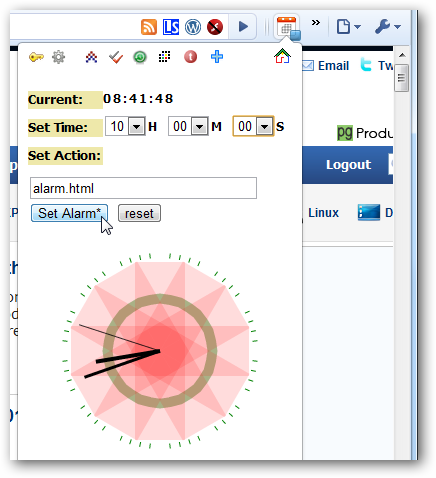 Click the green circle icon, and then enter the time for the alarm to go off. Strangely it will only chime if the extension pane is left open, so if you click anywhere else in the browser or even switch to another program it will not chime. If you’d like to customize DayHiker’s settings, right-click on it and select Options, or select Options in the Chrome Extensions page. Here you can customize your badges and the DayHiker icon, or enter a custom domain for your Google Apps Pro calendar. If you rely on Google Calendar to stay on top of your schedule, DayHiker can help you stay scheduled and know what’s coming up. We wish DayHiker supported multiple calendars so we could combine our Google Apps calendars with our personal Google Calendar, but even still, it is a very useful tool. Whether you’re a tightly scheduled person or just like to jot down to-dos and keep track of them, this extension will help you do this efficiently with familiar Google tools.